The Scottish Government’s education minister is hoping new Gaelic schools will help to provide a supply of people able to teach the language in the future. Alasdair Allan MSP yesterday officially opened the new £6.1million Lochaber Gaelic Primary School – Bun-Sgoil Ghàidhlig Loch Abar – at Caol near Fort William. It is Scotland’s fourth dedicated Gaelic school, and the second in the Highlands. He said one of the biggest challenges for the government was finding enough Gaelic teachers to meet the demand across Scotland. The minister said: “Clearly there is a demand in Lochaber for Gaelic medium education and the government has been very happy to work with Highland Council to make sure that happened. “We have just opened a Gaelic school in Portree and there is a Gaelic primary school in Inverness. “With clear demand throughout Scotland for Gaelic medium education, the challenge for the government has been keeping up with that demand in terms of provision of teachers. The shortage of Gaelic teachers was highlighted by the situation at Inverness Gaelic Primary School – Bun-Sgoil Ghàidhlig Inbhir Nis. The position of head teacher has been advertised at least 10 times since it opened in 2007, with the council struggling to find a fluent Gaelic speaker to take on the role before the current head, Barbara Smith, was appointed last year. 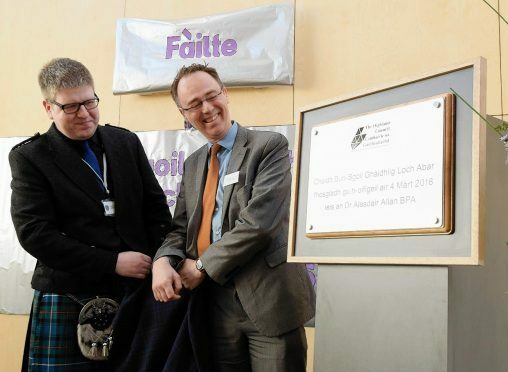 Mr Allan and the Lochaber school’s head teacher John Joe MacNeil jointly unveiled a plaque during the official opening ceremony at the Caol school yesterday morning. Piper Moira Robertson opened and closed the ceremony and the pupils sang the Gaelic song ‘S truagh nach robh mi còmhla riut – “I wish I was with you” – for their guests, some of whom had been working towards the provision of a Gaelic school in Lochaber for more than 20 years. One of these was Morag Melville, who said it was a particularly significant day for her and everyone involved in bringing the school to fruition. She added that there had been just eight pupils when the Gaelic unit opened at Fort William RC Primary School, known as St Mary’s, in 1994. The new Gaelic school, which opened in August of last year, currently has 70 primary pupils and 15 children in the nursery.